Researchers Say 3 Embryos Is Too Many For IVF : Shots - Health News British researchers say the time has come to buckle down on the number of embryos used during in-vitro fertilization. Three or more is entirely too many, they concluded after looking at data on more than 124,000 IVF treatments. Only last week we reported on the explosion in the number of twins in this country, largely a result of women turning to fertility treatments. Now, British researchers say the time has come to buckle down on the number of embryos used during in vitro fertilization. Three or more is entirely too many, they concluded after looking at data on more than 124,000 IVF cycles that resulted in 35,514 births. The problem? Births of multiples are risky for moms and babies. And using more than two embryos doesn't boost the odds for a successful live birth anyway, they conclude. The authors say: "A clear implication of our study, therefore, is that transfer of three embryos should no longer be supported in women of any age." 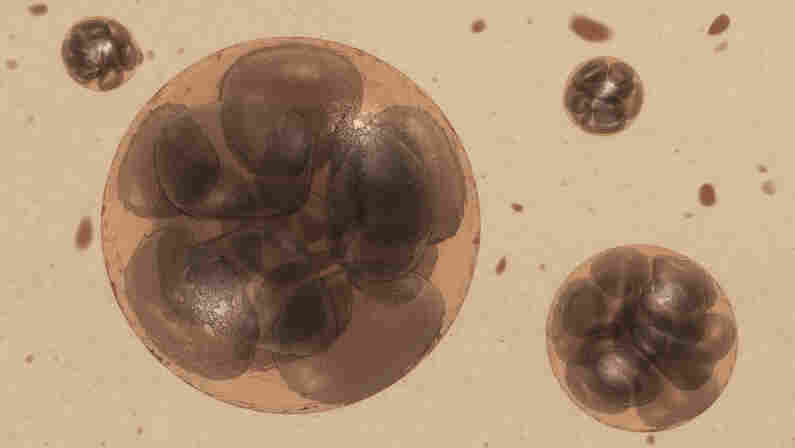 Doctors have used multiple embryos in IVF to increase the chances for a successful birth. And the analysis finds that using two embryos does lead to more live births than a single embryo for moms, regardless of age. How about three? In women younger than 40, birth rates were actually lower when three embryos were used instead of two. In woman 40 and older, the birth rates were were about the same whether two or three embryos were transferred. But using three embryos raised the risk for trouble, including multiples (especially in women under 40) and low birthweight for the offspring. When it comes to using one embryo or two, the researchers note that the age of the mom is worth considering. Birth rates are lower for older women and two embryos help raise the odds a little. Also, women 40 and older were less likely to have problems, such as multiple births and low birthweight babies, than the younger women getting two embryos. The researcher notes that a lot of IVF involves three or more embryos (about 40 percent of cycles in U.S. and 20-30 percent in Europe). Data from 2009 compiled by the Centers for Disease Control and Prevention show that the average number of fresh embryos used in IVF treatment of women over 40 was a little more than three. For women 40 and younger, the average number ranged from 2.1 to 2.7. For most women younger than 35, the American Society for Reproductive Medicine recommends just one embryo for an IVF transfer, according to guidelines published in 2009. The recommended limit increases to two embryos for 35- to 37-year-olds and then to three for women between 38 and 40. For women 40 to 42, five embryos are the recommended maximum. For women 43 and older, the group says there aren't enough data to set a limit.